WATCH Are Flying Bikes the Solution to Road Traffic? You don't have to rent "E.T." to watch a bike soar through the air. 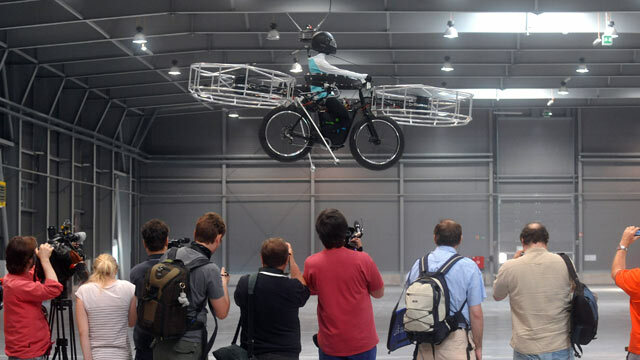 Engineers in the Czech Republic have successfully tested their flying bicycle project, F-bike. Instead of an adorable alien, a life-sized dummy sat on the bike seat while the crew used a remote control to pilot the bike around the PVA Expo Center in Prague. The bicycle was able to lift off, hover, steer and land during its five-minute flight. F-bike is a joint effort among several tech companies, but is spearheaded by Technodat. When the project first started in the fall of 2011, it was conceived as a high-tech electric bicycle without any flying capability. But the "e-bike" idea was too mundane to be worthy of pursuit, according to F-bike's website. Instead, they drew inspiration from the flying machines found in the novels of Jules Verne and Czech author Jaroslav Foglar. Unlike those fictional vehicles, however, F-bike flies not with wings but with six motorized propellers attached to the bike's frame: two propellers in the front, two in the back, and one on each side of the seat. Technodat CEO Ales Kobylik sees several more unmanned tests in F-bike's future. Although they are planning on testing the bicycle with an actual human rider, no timetable has been set. "The project steering committee will decide about the human test in early July," Kobylik told ABC News. As for when the bicycles will come to market, Kobylik emphasized that the F-Bike was always meant to study and not as a commercial venture. "The objective of the F-Bike project was the flying bike study and not flying bike production," Kobylik said. Looks like we'll have to keep watching "E.T." for a little while longer, although you can check out the F-bike in this video here.